It is always profitable to start eraser making business as along with earning profits for yourself you can also create employment opportunities for people. Before starting any business one should always conduct a proper research regarding that business in order to be successful. In our previous article we discussed about ‘school uniform making business’ and ‘black board chalk making business’. Today we are going to tell you about the nuances of eraser making business so that you can successfully carry out this business. This product is widely used by the kids and it has high demand. This product is also used by college students and office workers. To make eraser the most important material required is Rubber and there are 2 types of rubber that are used for this purpose. One is Natural Rubber and the other one is Synthetic Rubber. To make synthetic rubber petroleum products like ethylene and styrene are used. On the other hand natural rubber is obtained from rubber tree’s latex. These are used for colouring the eraser. The colourful erasers that you see in the market are made with the help of these organic dyes. Sulphur is used for vulcanizing the eraser. Vulcanizing process helps to make eraser strong. To make eraser strong heat and sulphur are used so that it is durable and heat resistant. From where to buy sulphur? You can buy it at any chemical store or you can also buy it online https://dir.indiamart.com/impcat/sulphur-powder.html through this link. 120 gms of sulphur will cost you around Rs 300 but if you buy it in bulk then you can get some concession. It is also used for making eraser. It is used for softening the eraser and shaping it. The price for it starts from Rs 100. You will require Abrasive, Lithopone and Factice for making eraser. It depends on what type of machine you are purchasing, i.e. if you buy a machine with high manufacturing capacity then it will cost you around Rs 10 lakhs and on the other hand the one with lower capacity will cost you less. Firstly you need to decide that what kind of rubber you will be using for making eraser, whether synthetic or natural rubber. There is no difference between the erasers made from either one of these rubbers so you can use any rubber. Then after deciding on it buy that particular rubber. If you buy synthetic rubber then it comes in the form of powder whereas natural rubber is not. So you need to convert the natural rubber into powder form. Mix the above mentioned chemicals in the rubber powder. After mixing well you need to melt this mixture using the machine. This mixture will become soft and solid after melting. Shape the erasers with the help of machine and the eraser will be ready. After making eraser the next most important task is packaging. Erasers are packed in two types; in one type of packing polythene is used to wrap it and in second type a cardboard or paper is wrapped around eraser. Choose either one of them. Apart from this to pack these erasers you will require cardboard boxes. You will require getting these boxes made from any manufacturer of cardboard boxes. If possible then get your company name printed on these boxes. This will also help in promotion of your company. To establish this business you require 600-1000 acres of land. It depends on what scale do you want to operate your business. If you are taking up this business through machinery then you won’t require much land. The erasers available in the market are priced as low as Re 1. So keep the price of your eraser nearby the price of other competitors. If possible then price your eraser lower than the market price of the available erasers in the market. This can help in good sales of your eraser. 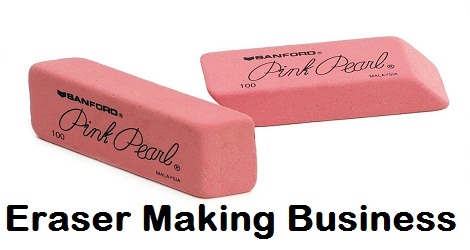 As and when your business starts to flourish you can increase the price of your eraser. Rubber is such a material that is used to make variety of products. So if you want then after your business is established in a well manner you can start another business related to rubber. For e.g. you can manufacture the pencils with rubber at their end or you can also start manufacturing rubber stamp business. Even if you start your business at small scale, it is important to get your business registered and obtain proper license. By registering your business you get to avail various government benefits. After getting the firm registered the next important step is to obtain a license. It is important to obtain a valid license for this business. You can get your license from the local authority of your state. Many companies are into manufacturing of erasers and their erasers have good sale in the market. So you will require promoting your brand well in order to stand out of your competitors. Through promotion people will get to know your brand and this will help in boosting the sales of your eraser. You can promote your brand at small scale level. You can give advertisement in any local newspaper. You can distribute free samples to local school children so that they can know about your brand and purchase it in future. You will have to spend more if you want to promote your brand at large scale. You can present your ad on TV Channels. So you should opt for this method when your business is well established. You will have to employ some workers for this business. If you are starting at small scale then you will need 8 to 12 employees and it will just double for large scale business. Try and keep those employees for work who have some prior knowledge related to the business. Get proper training to learn how to make erasers. You will be required to train the employees to handle the machinery so that they can operate smoothly. 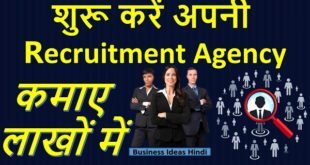 You will need at least 5 to 8 lakh Rupees to start the business at small scale and at least 10 lakh and more for large scale business. If you don’t have enough money to start the business on your own then you can avail the facility of loans from any government bank. You can also take loan from private bank and it will be faster but at higher interest rates. Government banks take time to grant loans but their interest rates are much lower as compared to the private banks. Decide beforehand that from which bank you want to take the loan facility. Start this business when you have complete knowledge of eraser making business. You can face some difficulties while starting the business but if you keep patience and try to do well and put in your utmost efforts then you can succeed in this business.